nVidia, the leaders in graphics chip technology chose web3D to showcase their products and technology on the web. Learn how nVidia’s graphics chip technology empowers Microsoft’s XBOX; or exlpore the next-generation of PC video Cards. 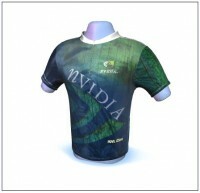 Pick something out from the nVidia Webstore. These product presentations were created at Cycore North America for nVidia’s website. The models were created with the help of Johnny Leung and Andre Kun.